In need of a little comfort this weekend? Or maybe just a fabulous centerpiece? Pot Pie will get you there. You know what to expect out of a pot pie, and this one will never in a million years disappoint. Flaky pastry, creamy béchamel, peas, carrots, and toothsome seitan. It’s a downright necessity at the holiday table and, fine, I’ve been known to eat it for breakfast, too. So what, I’m an adult, and I can do as I please. If you don’t want to use seitan, then two cups of cooked chickpeas work great, too! 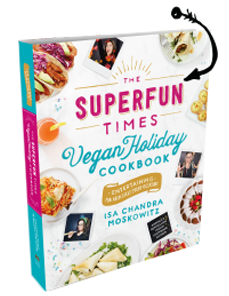 This recipe is from The Superfun Times Vegan Holiday Cookbook, out 11/15/16! ~ There’s nothing truly scary about pie dough, but I can’t make you not scared of it. So, if you’d rather by two frozen ones, then go for it! The trick to making them look homemade is to let it thaw and then put one in a different pie plate, pressing it down and flattening the edges along the rim. Cut off any excess dough to use for cute scraps on top. After filling it, take the other thawed dough, and tuck it over the filling, again cutting off any excess dough for scraps. Pinch the edges together and use a fork to seal the rim (as shown). Brush with a little milk and place the scraps on top in cute autumnal leaf shapes. NO ONE WILL KNOW. Maybe I even did that for this photo, hmmm? Preheat the oven to 425°F. Line a 9-inch pie plate with the bottom crust. Roll out the top crust and put in the fridge until you’re ready to use it. Preheat a cast iron pan over medium heat. Heat 1 tablespoon of the oil, then sauté the seitan until lightly browned, about 3 minutes. Transfer the seitan to a plate. In the same pan, heat another 1 tablespoon oil and sauté the onion and carrot with a pinch of salt until the onion is translucent and the carrot is slightly softened, about 5 minutes. Add the peas, celery, thyme, sage, remaining 11⁄2 teaspoons salt, and a few grinds of black pepper and sauté until the celery is softened, about 2 minutes. Add the remaining 2 tablespoons oil and, using a slanted wooden spatula, stir constantly as you sprinkle in the flour. Keep stirring to toast the flour, adding up to another tablespoon of oil if necessary. Toast just until the flour is a shade darker, about 3 minutes. Stream in the vegetable broth and mix until there are no clumps, then add the almond milk. Let cook until thickened, about 5 minutes. Layer the seitan in the bottom pie crust. Pour in the filling mixture. Place the top crust over the filling and seal the edges. Make a few slits in the top crust to let steam escape. Bake until golden brown and bubbly, about 35 minutes. Let cool for 30 minutes before slicing and serving. This recipe was so easy, so quick, and so impressive. I kinda cheated and used Gardein Chickn Scallopini chunks instead of seitan, and a frozen pie crust. I have three kids (aged 5-13), and they gobbled it up. I served it with potatoes because…potatoes. The perfect wintery day food! Thanks for this recipe, Isa. I made this for Thanksgiving and it was delicious! Again. How is this possible? So delicious! You never fail. I made this as a last-minute dish for Thanksgiving, using both the olive oil crust recipe and the one for your seitan “chicken” cutlet as well. Simply yummy! Based on Heather’s comment above, I decided to add a couple of diced red potatoes to the pie, and it didn’t harm it in the least. My Thanksgiving table was wonderfully enhanced. So delicious and easy!! I used veg chicken nuggets for convenience and it was really tasty. Ack! I made the recipe and am ready to put it in the oven (at what temp? for how long? ), but the recipe disappeared off your website! thank you thank you for all of your delicious recipes I’ve enjoyed over the years from your books and website. Just made this for Christmas dinner and everyone LOVED it!!!!! The taste was incredible and the whole meal we were all just exclaiming over how delicious it was and all your recipes, Isa! Highly, highly recommend! It was my first time working with pie dough (I bought it frozen from the store, but was still scared), but this recipe helped me in my first step as an introduction, and I loved it. Soooo wonderful having that light crispness against the delicious, creamy filling. Yum! i made the phyllo pot pie from your other book and it made 2! i want to give one to a friend who comes back from out of town in a few days. The Best Ever!! We’ve already made this 3 times since getting the book. 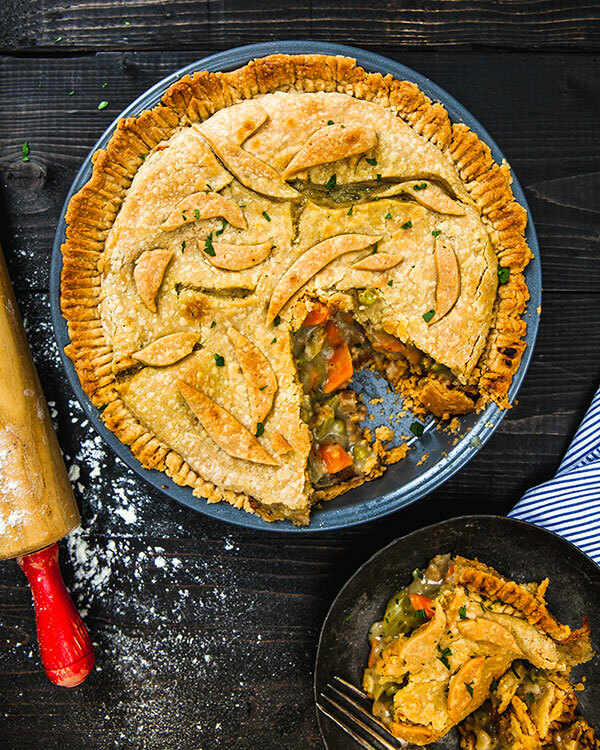 This is fantastic, I’ve never been able to fully replicate the beloved pot pies of my childhood- until now. The béchamel beats out all the other cashew bases I’ve used in previous pot pies, hands down. We were out of peas so I subbed in some corn which added a nice hint of sweetness. Thanks for such a fabulous recipe! This was AWESOME. I made your olive oil crust and my husband, 3-year-old, and I all LOVED it. We’re definitely adding this into our recipe routine for chillier months. Thanks, Isa! We love you! Thank you for your great recipe! I have made this several times (using purchased pie crusts and dairy milk instead of non-dairy) and it has been awesome every single time. It is my son’s favorite now. I have even made mini pot pies in muffin tins so he could take them to school for lunch. Thanks for the great recipe! I would love to taste a pot pie like that. It looks absolutely fabulous. My name is Jim, click here to share your thoughts. Thank you very much this is amazing and great article good work bro. I like it! In order to play online free online cards games these spades games will be the best option for you to play cards games. As these games can also be played online without any type of sign in process. As these games can also be played online without any type of sign in process. What I would love to taste a pot pie like that. It looks absolutely fabulous. My name is Jim, click here to share your thoughts. Yummy this pot pie looks so delicious. Thanks for sharing this recipe. Now I’m gonna make it home. Thank you so much for this article. And i want also that i complete my responsibility about this internet explorer clear cache article so that all user know about this feature and he can use this. I am allergic to cellery so I am wondering what other vegetable I could use instead. I was thinking potato or some kind of heat tolerant green vegetable (brocoli, green beans, etc). Anyone have any advice? Just made this for Christmas dinner w/mashed potatoes & mushroom gravy on the side. The pie was outstanding, the seitan was the best ever. So, now I know, you are the best vegan cook I have ever come across and full of sass to top it off. Thanks Isa. You’re a gift. Amazing recipe!Thanks for sharing this recipe. I’ve made this with great northern beans, using their broth. It came out great! The bean starch adds a really nice creaminess to the sauce. You have to be aware of the Amazon Gift card code to avail the benefit of these codes. However, you get Amazon promo codes in March 2019 on selected products. This recipe was so easy, so quick, and so impressive.